As promised, today I am sharing the recipe for the red quinoa and edamame salad I teased about last time. This recipe is so simple, you can hardly even call it a recipe yet it yields such a colorful and flavorful dish. The fact that it is packed full of nutrition is just a nice bonus. Using red quinoa here is key. Don’t even think about substituting in white quinoa. Despite what I have read, I think red quinoa has a stronger, nuttier flavor than white. And the color, oh the color … deep, bold, red. Trust me, stick with the red quinoa for this one. The olive oil you use in this dish will make all the difference. Taste the olive oil plain first. If you don’t like the taste of the olive oil on its own, you won’t like the taste of the finished dish either. I usually use Trader Joe’s California Estate Extra Virgin Olive Oil. However, lately I have been lucky enough to be able to use some of the most beautiful and delicious olive oil from Turkey. It is a gorgeous clear golden color, like sunlight in a bottle and the taste is sublime. It was a gift from a friend of ours whose parents had pressed the oil from olives picked from their own trees in Turkey. They have over 2000 olive trees on their property and our friend helped plant about 500 of them over several summers when he was young. His parents, now retired, tend to the trees, pick the olives (with some help) and press the olives themselves. They are not commercial olive oil producers and don’t sell their olives to larger companies. They just grow the olives and make the olive oil out of love for the process. Isn’t that what we all wish we could do? Don’t we all wish we could get to do something we truly love and share that love with others? Rinse the quinoa by placing the quinoa in a fine mesh strainer and placing the strainer in a bowl of water. The quinoa should be completely submerged in water. Stir it around with your hand for a minute or so and then wait for the quinoa to settle back into the strainer . Lift the strainer up and pour out the water. Repeat a couple more times until the water you pour out is completely clean. Drain the quinoa. Pour the quinoa into a large saucepan. Add water and bring the water to a boil. Stir in salt, reduce heat to low and cover. Simmer gently until quinoa is tender, 20-30 minutes, stirring the quinoa occasionally to prevent sticking. When quinoa is done, add frozen edamame and cook for 1 minute more until edamame is just tender. Drain the quinoa mixture in a fine mesh strainer to remove any excess water. Pour quinoa mixture into serving bowl. Taste and adjust salt as needed. Drizzle olive oil over the quinoa mixture, and stir gently until olive oil is evenly mixed in. Recipe adapted from Chef Monica Pope. 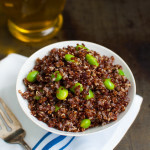 I love the color of the red quinoa – it’s just so pretty! This looks wonderful! So simple too! I love the simplicity of this healthy recipe! !